our planet published by NASA on their Earth Observatory site. Issued by NASA - International Space Station. 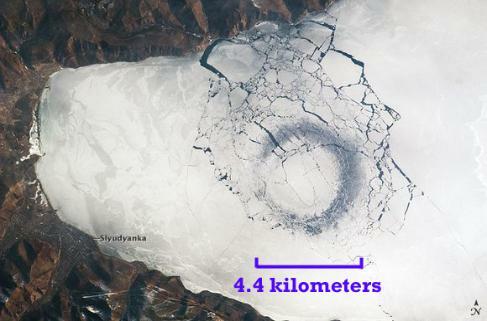 that the feature was first visible on April 5, 2009. 1985 (during the STS-51B Shuttle mission). images on April 27, 2009. What can cause convection, bringing warmer waters to the surface? 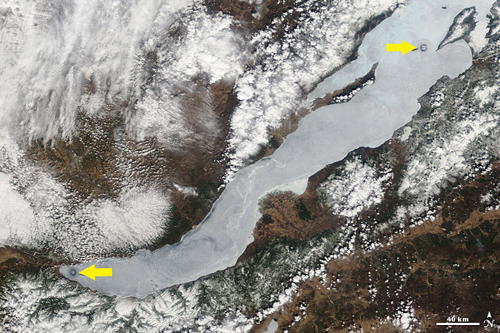 from its location in the Baikal Rift Valley. water seals and several species of fish that are not found elsewhere on Earth. See second image below. Copyright: NASA International Space Station. 2009.